Monaghan's Ryan McAnespie with Galway's Gareth Bradshaw. ©INPHO/John McVitty. Johnny Heaney’s goal on the hour propelled Galway to a vital 1-9 to 0-11 victory over lacklustre Monaghan at cold, blustery Inniskeen. In a forgettable and low-quality football match on the stony, grey soil, the visitors stepped up their game upon the resumption to deservedly take both points and send the Farney County into a relegation battle despite the fact that they beat Dublin a fortnight ago. Heaney netted with ten minutes of normal time remaining and the losers registered four unanswered points as a total of 15 more minutes were played but their desperate rally was too little, too late. At the end of a poor first half, the elements wreaking havoc, the hosts led by five points to four. Jack McCarron had Malachy O’Rourke’s men ahead from a pointed free into the strong wind on two minutes and added his second ten minutes later after Conor McManus dropped over another free in the ninth. Padraic Cunningham should have netted for the winners and Ruairi Lavelle made an excellent stop with the studs of his right boot to deny Dessie Ward a Monaghan major at the other end. Ironically considering how defensively they had set up with the gale behind them, it was full back Johnny Duane who registered the Connacht champions’ first score in the 20th minute. Vinny Corey pushed the gap out to three and Galway finished the first half strongest with a brace of Shane Walsh points, Rory Beggan getting down well to deny the Tribe attacker in between. 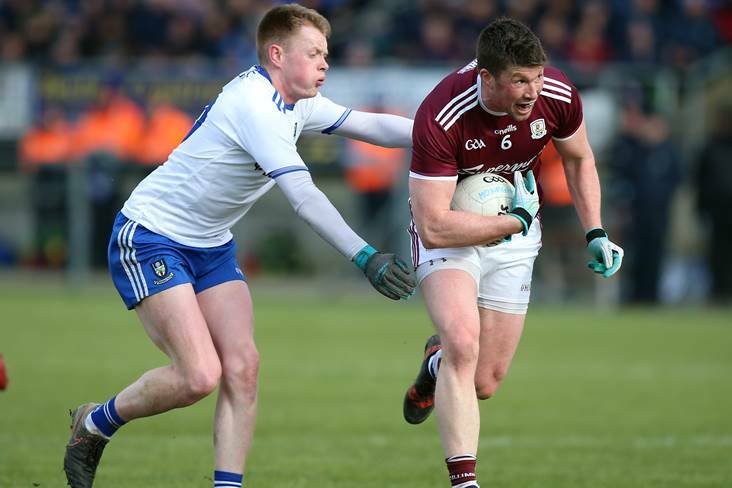 David Wynne passed over on another excellent Galway goal chance and Darren Hughes lofted over Monaghan’s fifth point before Walsh’s free closed the first-half scoring. Antoine O Laoi equalised within 30 seconds of the restart but McManus quickly restored the Farney County’s advantage only for Walsh to make it six points apiece from a simple free after Drew Wylie barrelled into O Laoi. McManus telegraphed his pass as Monaghan bore down on goal and they were punished when Cunningham had the freedom of Grattan Park to pop over the lead point in the 43rd minute, Walsh following up from a free four minutes later to leave two between them. Having mustered just four scores with the wind behind them in the first half, the westerners doubled their tally within twelve minutes of the restart. McManus missed a free after taking a mark at the other end and no sooner had he curled one over than substitute Michael Daly speared over the Tribe’s ninth point. The Monaghan defence parted like the biblical Red Sea in the 60th minute, leaving wing back Heaney with the simple task of proding the ball past Beggan to the top right corner of the net from close range – 1-9 to 0-7. A McManus free took the deficit back to four points with eight minutes remaining and Beggan advanced to thump over a free 90 seconds later. Hughes fisted another Monaghan point in the first of four minutes of injury time and a Beggan ‘45’ left the minimum between the teams with two minutes of additional time left but Galway played down the clock and held on for a precious, fully-merited victory as McManus fluffed his lines from a last-gasp effort. Galway - R Lavelle; E Kerin, J Duane (0-1), D Wynne; G O'Donnell, G Bradshaw, J Daly; T Flynn, K Duggan; J Heaney (1-0), P Cooke, S Kelly; A O Laoi (0-1), P Cunningham (0-1), S Walsh (0-5, 3f). Subs: D Cummins for P Cunningham, M Daly (0-1) for P Cooke, B McHugh for J Duane, C Darcy for F O Laoi. Monaghan - R Beggan (0-2f); K Duffy, D Wylie, R Wylie; V Corey (0-1), B Kerr, C Walshe; D Hughes (0-2), F Kelly; R McAnespie, J McCarron (0-2, 1f), S Carey; D Malone, D Ward, C McManus (0-4, 3f). Subs: N McAdam for F Kelly, C McCarthy for J McCarron, D Mone for N McAdam, O Duffy for R McAnespie, D Garland for K Duffy.